Vice President Yemi Osinbajo yesterday gave his support for the introduction of state police just as he affirmed that the Muhammadu Buhari administration has implemented some of the recommendations of the 2014 Constitutional Conference. The vice president spoke through his Senior Special Assistant on Media and Publicity, Mr. Laolou Akande in a radio programme. He spoke against differing interpretations of the vice president’s intervention in the ongoing debate about the restructuring of the country. The vice-president’s assertion that restructuring of the country would not make any difference had recently come under attack by some bodies in the country including Afenifere, the Yoruba socio-cultural organisation. Clarifying the position of the vice president on the issue of restructuring, Akande in the radio programme on Orange FM in Akure, Ondo State explained that while the Vice President questions whether the allocation of more funds to states from the federal would be helpful at this time considering the dwindling revenues from oil and taxes, he wholly supports the idea of having state police across the country as articulated in the APC’s Roadmap to a New Nigeria. 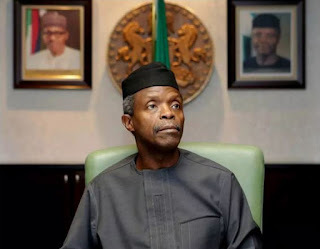 Details of Akande’s clarification on the radio programme made available by the vice-president’s office said Osinbajo desires a deeper debate on the issue of restructuring which he said should not be restricted at the level of resource allocation. He said the administration has implemented some of the decisions listed in the 2014 Confab report, not because it was in the report but because they were sound decisions. He listed two of such decisions to include the merging of Budget Office with National Planning as one ministry and also the adoption in the 2016 budget of a 60-40% recurrent and capital expenditures.